Those comments were heard at Harry’s Plaza Café on December 21, three days after Guillen died of cancer. The room at Harry’s, where Guillen would unwind with fellow officials after they worked at high school football games, was jammed with family and friends celebrating his life. Earlier in the day, a huge crowd turned out for a graveside service at Calvary Cemetery. People were decked out in sports attire. A few wore black — not the traditional memorial garb, but showing their allegiance to the Raiders. Most prevalent were the colors and emblems of Notre Dame, USC, the 49ers, and the Lakers. As a running back at Chicago Vocational School, Guillen rushed for 123 yards in a 6-0 victory over Weber in Chicago’s 1955 Prep Bowl, played before 49,210 spectators at Soldier Field. He subsequently came west to play football at Santa Barbara City College and planted roots in the community. He and Barbara were married 53 years, lovingly nurturing their family of three daughters and numerous grandchildren. Certainly there were times Guillen made an unpopular decision on the field. “He learned how to be called every name in the book [‘zebra’ being one of the kindest] and not let it bother him,” Barbara said. 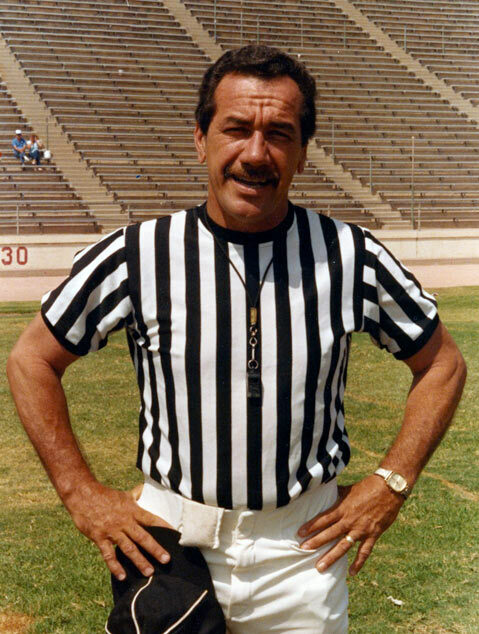 While there are three Santa Barbara natives working weekends in the NFL — Cavaletto (a Bishop Diego High grad), referee Bill Leavy (Santa Barbara), and side judge Laird Hayes (San Marcos) — Bob Guillen remained close to home, the consummate local sports official. GAUCHO HOOPS: If it had been a field-goal kick, the football would have hit the crossbar and both goalposts. That’s how improbable was the trajectory of Orlando Johnson’s three-point shot that gave UCSB a 58-57 basketball victory at Cal Poly on Monday night. There were about nine seconds to play when Johnson froze a defender, elevated, and released the ball from the corner. It hit the rim, bounded almost to the top of the backboard, dropped to the rim again, ricocheted off the backboard, and spun through the hoop — by which time the clock was down to five seconds. Cal Poly’s last attempt fell short, and the Gauchos began the New Year with a victory that sent them off to a positive start in the Big West Conference. Bob Williams surpassed Jerry Pimm as the winningest UCSB men’s basketball coach with his 223rd victory. Williams would rather have reached the milestone earlier, but the Gauchos were unable to pull out a victory in a tough road trip to Washington, Cal, and BYU. Now 6-5 overall, UCSB hosts the Big West’s hottest team, Cal State Fullerton (10-3), at the Thunderdome on Thursday night, January 5. It will be the Gauchos’ first home game in 35 days since their double-overtime defeat to UNLV. A significant development at San Luis Obispo was the emergence of UCSB’s Barkley-esque freshman Alan Williams (13 points, 10 rebounds). He could become a fan favorite. The Gaucho women also had a dramatic game at Cal Poly with a different outcome, a 61-58 loss after the Mustangs converted a three-point play with 2.3 seconds remaining. It spoiled UCSB coach Carlene Mitchell’s Big West debut. Her women play at Fullerton on Saturday and will host UC Irvine in their next home game January 12. CHAMPIONSHIP REMATCH: Ohio State outlasted the Gauchos in five games to win the 2011 NCAA men’s volleyball final at Penn State. The same two teams will take the floor at Robertson Gym at 10 a.m. Friday, January 6, in the featured opening match of the UCSB/asics Invitational. Other participating teams include 19-time national champion UCLA, UC Irvine, and BYU. Most matches will be held at the Thunderdome on Friday. All of Saturday’s matches will take place at Robertson Gym, leading up to the championship at 6:30 p.m.